In a wide-mouth jar, fill with herbs or whatever you’re using for the tincture. Cover (and then some) with the alcohol. Let sit and keep an eye on. Once the alcohol seems to have leeched all the color from the botanical, strain it out and seal into a dropper bottle. Assorted reading has led me to believe that leaving the botanicals in the alcohol beyond this point only serves to make it more bitter than it has to be. Pretty self-explanatory. Small fistful of rosemary, covered with Everclear. Seemed to hit peak of color around the two hour mark. This one is going to be interesting to try. Didn’t use actual jalapenos, as I was out, so just attempted with a tea bag full of dried red pepper flakes. It was slow to start leeching color, but in the end only took about 3 hours. Tried a drop, and it is actually pretty hot. Want to also try out with real peppers. Used Vodka rather than Everclear. Tea bag full of ground clove (would have preferred whole cloves, but didn’t have any) and the zest of one lemon (no pith). The clove lost color and went gray after about 45 minutes, so I removed that and left the lemon for an additional hour or so. Vodka, not Everclear. Used the tea bag method again with ground cinnamon because we were out of whole sticks. Tastes pretty good, would like to try the alternative. Maybe could have let sit longer than I did OR use more cinnamon because while tasty, could stand to be stronger. Where did you get the tincture droppers? The shipping for the bigger bottles can add up, but I still really like these guys for this kind of thing. The dropper bottles are really cheap and the shipping for small bottles isn’t that terrible. Thanks for the link to Whisky Business! Loving your blog and will definitely be sending my readers over. This is one of the most complete mixology blogs I’ve seen! No problem! I love your site too! It’s difficult to find people with interesting things to say about whiskey for some reason. You flatter us! Have you tried these? Any conclusions as to which is better: 151 or vodka? And have you determined how long the mint tincture lasts? 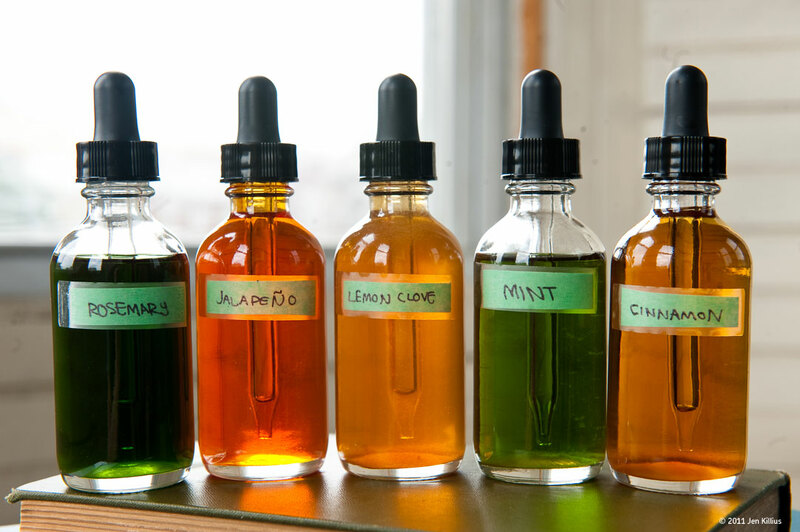 I’ve read that starting with fresh herbs limits how long the tincture lasts. Any further tips you have come up with would be appreciated. I personally think the everclear worked a bit better than the vodka and seemed to last longer. I probably wouldn’t use 151 unless I was going for a very specific kind of tincture because that rum flavor really comes through even in smaller doses. As for the shelf life, the first batch we made is still, for the most part, viable. The mint lost a lot of its nice bright green color, and while it still tastes strongly of mint, the spirit flavor is a bit more evident. About a year out, I would shy away from using it in more delicate drinks, but don’t have much issue including it in something with a good strong base like whiskey. The rosemary and jalapeno are following the same path as the mint, but more slowly. The peppercorn and cinnamon tinctures we made seem to be holding up the best, almost unchanged so far. I wouldn’t bank on them lasting forever, in any event. They’re really simple to put together, and while they will technically last forever, the flavor deteriorating is a good enough reason to make a new batch once a year for me. Don’t label Red Pepper Flake Tincture as Jalapeño Tincture…. This post annoys me.